Canon’s latest compact system camera is perhaps the first time the company has launched a CSC for a “serious” audience. The EOS M5 features a 24.2 megapixel, APS-C sized sensor, which is joined by a Digic 7 processor. It is, in essence, a miniature version of the Canon EOS 80D. Other interesting features include Dual Pixel CMOS AF, and a shooting speed of up to 9fps. It can record full HD video, and has WiFi and NFC built in. 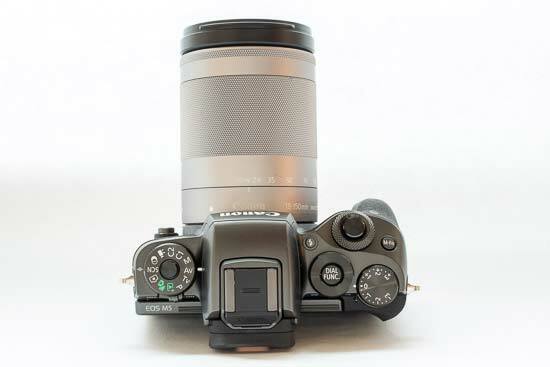 Canon EOS M series cameras have their own lens mount (EF-M), but you can buy an optional mount adapter which allows you to use any DSLR EF lenses with the EOS M. There are a couple of variations in how you can buy the Canon EOS M, including body only. We have been supplied with the new 18-150mm lens to test the camera with, along with an EF-M macro lens, and an EF adapter with the 50mm f/1.8 STM EF lens. The EOS M5 body only costs£1,049 / $979. The EOS M5 with the EF-M 15-45mm f/3.5-6.3 IS STM lens costs £1,149 / $1099. The EOS M5 with the new EF-M 18-150mm f/3.5-6.3 IS STM lens costs £1,399 / $1479. 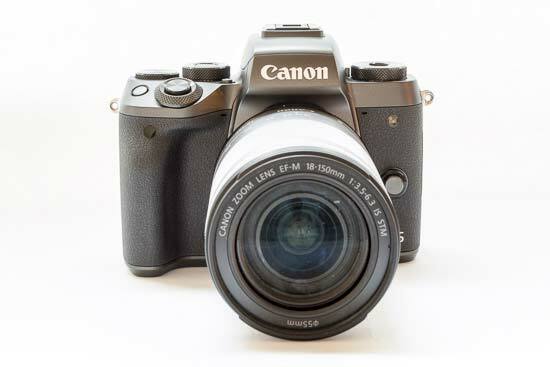 The Canon EOS M5 has a sort of miniaturised DSLR look about it, with nicely curved lines which give it a stylish look. It’s not quite on par with some of the retro cameras on the market, but it has an attractive look none-the-less. Around the front part of the Canon EOS M5 is a rubberised coating which makes it feel high quality, and also helps the camera feel nice in your hand. 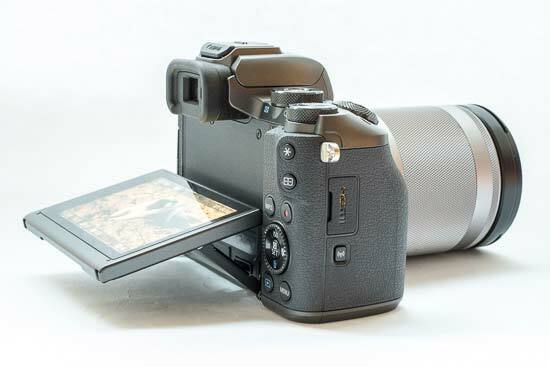 There is a protruding grip which again helps you get good purchase on the camera - with your forefinger resting naturally on the shutter release button. Those with particularly large hands may find that the camera is a little on the small side to fit all of your fingers comfortably on the grip, though. There are a variety of dials on the top of the Canon EOS M5. The largest is on the left hand side, and is used to change between the different exposure modes that the camera offers. Here you’ll find all automatic and scene modes, as well as a range of manual and semi-automatic options, such as aperture priority and shutter priority. The on/off switch is just below the mode dial, too. There’s handily space for two custom modes here, which is useful if you often find yourself shooting with one particular group of settings - perhaps high ISO or monochrome. To the right of the viewfinder, there’s an exposure compensation dial, and one dial which is around the shutter release, and another which is just behind it. You can use the two dials in conjunction with each other - it feels like a very natural way to work. They both control different functions depending on the shooting mode you’re in. When in aperture priority for instance, it controls aperture. The rear dial, when in manual mode, adjusts aperture. There’s a small button in the middle of the dial which you can press to use the dial for a different function, such as white balance or ISO. There are two more buttons on the top of the Canon EOS M5. There’s a small button for raising the camera’s inbuilt flash. There’s also a function button, which can be customised to a wide range of different options in the main menu, including file type, picture style, white balance, manual focus and more. Flip to the back of the Canon EOS M5 and much of its rear is taken up by the three-inch touch-sensitive screen. The screen tilts upwards, downwards, and can also face the front if you fold it underneath the bottom of the camera. This makes it particular useful for shooting hand-held selfies, but it’s not quite as useful if you want to place the camera on a tripod or other stable surface (such as a table) and take a self-portrait or group shot. 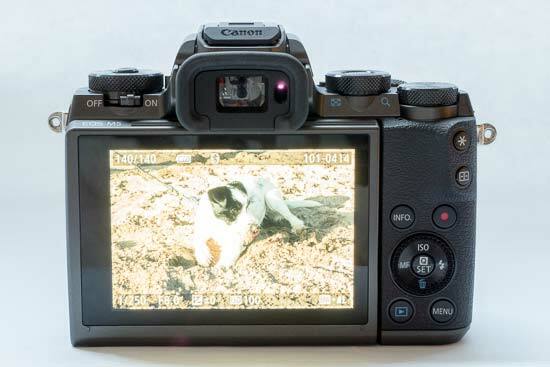 There’s a scrolling dial on the back of the Canon EOS M5, which can be used for certain functions, such as scrolling through images in playback. This doubles up as a four way navigational pad, with each directional key having its own particular function. For example, up controls ISO, left switches on manual focusing, the right is for flash modes, and the bottom key is used for deleting pictures in playback. However, you can customise all of these keys, along with most of the keys, to a different function if you prefer, meaning you can set up the camera exactly how you want to use it. If you press the central key in the middle of the scrolling dial, you’ll be taken to the quick menu. This can also be accessed via a virtual button on the screen. With this, you can quickly access a variety of settings without having to delve into main menu settings and so on. Around the rear scrolling dial there are four keys. One is used to switch between different display settings, such as the on-screen level, one is the playback button, another is used to access the main menu, and a fourth is for starting to record video. The final two buttons are found on the thumbrest, and again can be customised to your own tastes, but have default settings of exposure lock and AF point selection. Although you can use the AF point selection button to enter the AF selection options, the easiest way to set AF point is to use the touch screen, simply tapping where you want the AF point to be. You can use the touch screen to do this in conjunction with the viewfinder if you want, by selecting “Touch and drag AF settings” in the main menu. A great feature is that you can use the whole screen to do this, or you can apportion a section of the screen, for example the bottom right to allowing you to change the AF point - this is particularly handy if you find that your nose or face is accidentally moving the AF point when you don’t want it to. The Canon EOS M5’s electronic viewfinder is found in middle of the top plate of the camera. There’s an eye-sensor for automatically detecting when it has been lifted to your eye, making it a very fluid movement akin to using a DSLR. It’s not the largest viewfinder currently on the market, but it is very bright and clear and there’s no obvious or noticeable lag when using it for most every day shots. Colours inside the viewfinder appear to be more vibrant and more saturated than colours displayed on the rear screen, and indeed in the final images - so just be aware that the image you see in the viewfinder may not be a 100% accurate representation of the image you’re going to end up with. A quick note about the flash, if you’re using the 18-150mm lens, as we were. The flash is quite small, so it’s not quite tall enough to reach fully over the lens - this means that in some circumstances the lens will obscure the light of the flash and create a shadow. You shouldn’t find this to be problematic with shorter lenses. As is pretty much standard now, the Canon EOS M5 has Wi-Fi connectivity. However, for the first time, there’s also bluetooth connectivity. You can use this as a low-power alternative to Wi-Fi to control the camera. It’s also easier and quicker to set up and use than connecting to the camera’s Wi-Fi network. Once you’re connected to the camera via Bluetooth, you can also use the Canon Camera Connect app (free download for iOS and Android) to activate Wi-Fi settings directly, which you’ll need to do to browse images and download images onto your phone. It’s quite a handy and useful app, but it’s not quite as useful as Nikon’s Snapbridge solution which automatically transfers images across to your phone ready for super quick sharing. The lens mount on the Canon EOS M5 is the EF-M mount, which is smaller than the regular EF mount. You can buy an adapter which allows you to use any of your existing lenses with the EOS M5. We were supplied one for this review - it works well, but is perhaps best suited to smaller EF lenses, as anything particularly large will give the M5 an unbalanced look. It’s useful however if you have say a specialised lens (i.e. macro) that you don’t want to buy again. 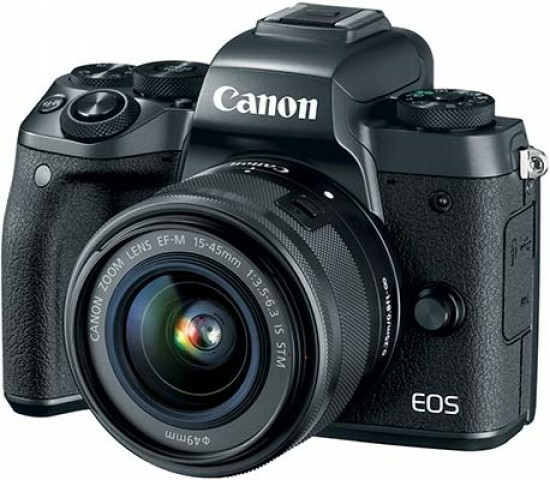 In terms of focus, the Canon EOS M5 has come on leaps and bounds from the Canon EOS M cameras of old. Autofocus is quick and accurate in the majority of conditions, pretty much no matter what lens you are using. In low light, you may find the system is a little hesitant if you’re using an older or slower EF lens, but the EF-M native lenses we were supplied for the test, along with a 50mm f/1.8 STM lens coped very well in a variety of situations. That said, there are still quicker compact system cameras on the market when it comes to AF. The EOS M5 doesn’t match the Panasonic G series for almost instant focus acquisition, and while continuous AF (Servo) does a reasonably good job with fast moving subjects, it’s not on a par with something like the Fuji X-T2 or the Olympus OM-D E-M1 Mark II. This wouldn’t necessarily be a huge problem if the EOS M5 was a mid-range camera aimed at beginners, but for something which is priced at over £1,000 (body only) it’s a little disappointing not to see more innovation in this area.